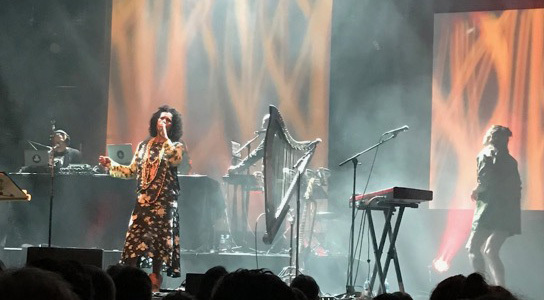 The Melbourne Recital Centre was a perfect setting for Neneh Cherry’s latest performance. Part cutting edge/ultra modern, part sophisticated and elegant, the venue was set up with a live DJ (spinning actual vinyl) on the mezzanine underneath the looming geometrical black windows framing the city’s buildings. 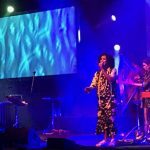 Cherry and band were in Australia to showcase her latest album, Broken Politics, a modern, sophisticated collaboration with Four Tet redolent with relevant socio-political comment. And, after a brief drum n bass focused set from opener WWWater, that’s just what they did. Cherry strode to the stage all flowing skirts, beads and oversized boots, backed by an unconventional group lead by husband and collaborator Cameron McVey, an electronic rhythm section chaired by drummer John Tonks, Preteesh Hirji on turntables and a young group of multi-instrumentalists (Rosie Bergonzi, Iona Thomas, Samson Srinuan) leaping between laptops, keys, bass, harp, percussion and xylophone. Broken Politics is a sparse, reflective and fairly dark work, more tone than melody. The bulk of tonight’s performance honoured that, but somehow Cherry managed to keep it fun. She started out playing a recording from her phone into the microphone while Bergonzi played the Hang. Cherry claimed she’d visited our food markets and the NGV’s Escher X Nendo exhibition and wished she didn’t have to leave Melbourne. Then, after a widescreen version of ‘Synchronised Devotion’, someone called out about The Dug Out in Bristol, which completely broke any remaining ice, evoking a spray of expletives from Cherry. A quick change out of cowboy boots and into sneakers announced a change of direction, the concert closing with ‘Manchild’, then an encore of ‘7 Seconds’ (dark and sparse, fitting well alongside the Broken Politics material) and, of course, ‘Buffalo Stance’ as the finale, bringing the entire audience to our feet to dance and sing. “It’s been real,” beamed a clearly elated Cherry.